Made by Dakota Saddlery in Alabama. They are known for making quality saddles and other tack at affordable prices. Made to fit a mule as opposed to a horse. While a mule is half horse (a mule is a cross between a male donkey and a female horse) their conformation is typically different, including through the back where the saddle rests. Below are Dakota mule saddles for sale. Below: A guide in the Grand Canyon National Park leads riders up Heartbreak Hill, a steep portion of the Bright Angel Trail. The guide and riders are all riding mules, which are often prized for their sure-footedness and endurance in rough terrain. Photo by the National Park Service. Public domain image. saddle they carry is in stock and ships the same day. Most of the saddles shown are new, but some might be used. Shipping is almost always included in the price for locations in the continental USA. Some saddles by HorseSaddleShop are listed twice. Why? It’s because HorseSaddleShop is one business (located in Bremen, Indiana), with two websites (HorseSaddleShop.com and eSaddles.com), and they often show the same saddle on both websites. In case one website would have a better deal on a saddle, saddles from both websites are shown. In the past we’ve noticed only the occasional Dakota mule saddle on eBay. If they have any, they can be seen below along with other saddles. The Bright Angel Trail is a hiking and riding trail in the United States that descends 4,380 feet into the Grand Canyon. It is just shy of eight miles long, or 10 miles if you include two common destinations (the Bright Angel Campground and the Phantom Ranch) at the bottom. It was originally used by Native Americans, but by the late 1800s it was also being used by other people, including miners. The miners saw the potential value of the trail as a toll road, took control of it and improved it, and began charging a toll for its use. After its formation in 1916 the National Park Service wanted to own and control the trail, which led to a long series of legal complications until they could formalize its purchase in 1928. The Bright Angel Trail is steep and well defined, with numerous switchbacks and narrow areas. The National Park Service classifies the Bright Angel Trail as a “corridor trail” which means it receives regular maintenance and patrols by park rangers. 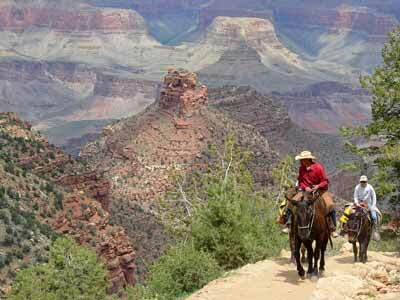 It is known for its breathtaking scenery and is popular with both hikers and mule riders. It has sections of sun and shade (depending on the time of day) as well as natural water sources that encourage vegetation and possibles views of wildlife. When a hiker encounters mules on the trail they (the hiker) are instructed to step off the trail on the uphill side. Hikers should stand completely still and remain quiet around the mules. Hikers should follow directions from the mule wrangler. Hikers should not return to the trail until the last mule is 50 feet past their position. 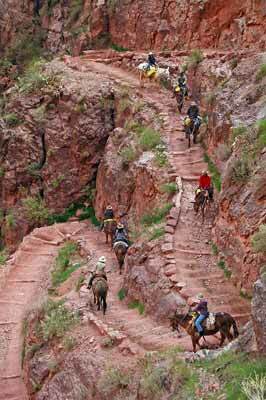 Below: A group of riders ride mules down Jacob’s Ladder on the Bright Angel Trail in the Grand Canyon. 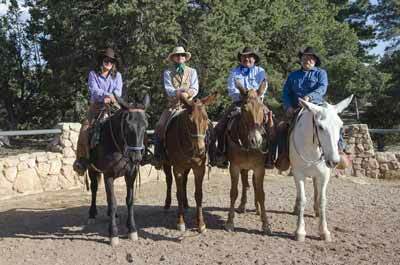 Below: Wranglers on mules in the historic Bright Angel Trail mule corral, which dates from 1937.